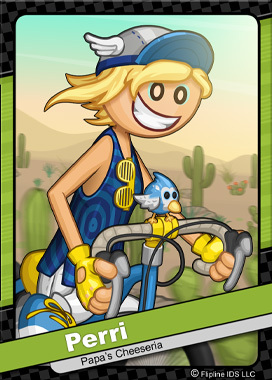 Perri is an enthusiastic cyclist from the town of Toastwood. An environmentalist at heart, her only mode of transportation is her trusty bike she calls “Old Blue”. Perri has a peculiar home on the outskirts of town. A while back, she purchased one of Toastwoods last remaining windmills. Perri repaired and converted it into a tiny wind-powered house. There she lives with her pet bluebird, Tart. Perri & Tart often take part in various cycling fundraisers. The most recent being Pedal for the Larks, a bike ride to raise money to protect the Brussel Larks.